I simply don't care. Claude Monet may sound like an Art History cliche but I savored my excursion to visit his retrospective in Martigny and couldn't believe my luck when I found out they would screen a documentary about him on French Television. Summer 2011 was the summer of Monet, this includes the splendid triptych of the Nympheas (what a poetic name for water lilies) in Basel. Perhaps because this Impressionist is a cliche, did I somewhat skip past the master while studying Art History, wanting to learn more of the less celebrated artists, those novel to me, and also, deep down, because the more classic intimidates me: I don't know how to handle all the details and the extensive studies on Monet. The documentary, on France2, from the series "Secrets de l'Histoire" did handle the mass of information expertly. The dandy presenter Stephane Berne made a king of Claude Monet and rightly so. The documentary had experts, descendants of Monet as well, many archives to show us and of course on location filming. 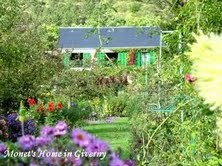 I now want to go to Giverny, in Normandie! It's magic is as alluring as the mythical Combray of Proust. In fact, I always pictured a Giverny painting by Monet when I read, the "cliche" writer Proust! I have visited Renoir's home in Cagnes sur Mer, have walked in the footsteps of Cezanne in Aix-en-Provence, looked for VanGogh's ghost in Arles, felt the spirit of Picasso in Antibes. I have gazed out of the windows of Matisse's red home in Cimiez, Nice almost every summer, knowing that he has painted the same window frame and the maritime view below. This documentary of an artist in his garden and home highlighted my very valuable personal experience of frequently visiting the sculptor Bernar Venet in his garden and home in Muy, France. His domain boats greenery and a river with his sculpted bridge that make a perfect backdrop for his monumental sculptures. I followed the documentary with great interest, surprised by the family intrigue, by the incidental details: the way he made his salad dressing, his inklins for curries and puddings, his desire to paint some interiors yellow. The documentary confirmed my idea that great artists work very hard. 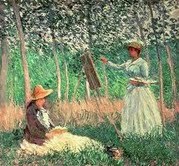 I had told my children "you will find a Monet in every museum you go, so you must learn to identify him" and this because Monet had painted series on the same theme, only at different times, in different light. The documentary took us to London and Venice, where he had traveled, to Rouen where he studied the Cathedral and we were taken to his vantage point, as I had personally been to Matisse's in Nice. I learned that he had two wives because his beloved died and was replaced by another he loved equally, who had 6 daughters, of which the youngest Blanche became his daughter-in-law and then when they both were widowed, she took care of him in his old days. It was the Summer of Monet but I only have one regret, that my children rushed me through the 70 paintings in Martigny, when I could have spent much more time gazing at them. 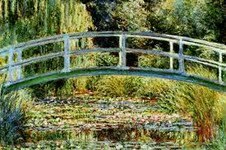 A trivial detail made me smile: Monet was born on November 14th, a Scorpio like me.